There are milder forms like heat rash, cramps in the larger muscles, and leg swelling after exercise. The most common form is Heat Exhaustion and the least common but most dangerous is Heat Stroke. Common symptoms may include profuse sweating, weakness, headache, nausea, and at times vomiting, fainting or inability to stand. Mental status is intact. Heat stroke includes all the above symptoms of heat exhaustion plus confusion and inability to think clearly and other symptoms of decreased mental status. What Temperature is the highest risk? Heat illness appears at any temperature depending on the humidity. The heat index (see below) predicts risk based on temperature and humidity. Your local newspaper, TV station or the National Weather Service provides information on humidity for the day. Just look at this table and judge the risk for Heat Illness on any day you ride or exercise outside. How does your body Adapt to Heat during exercise? clothing, lack of sleep and how well your body is accustomed-acclimatized to the heat. Diabetes may influence the health of your blood vessels. These diseases and medications influence your ability to sweat and accommodate to increased heat. But that does not mean you should not exercise. Recognize your risk and be prepared to prevent problems. Gradually increase your distance and resist large jumps in distance without prior practice at that distance in the heat. Give your body time to become accustomed (acclimatize) to exercise in the heat. It takes about 14 days of exercise in similar heat to acclimatize. 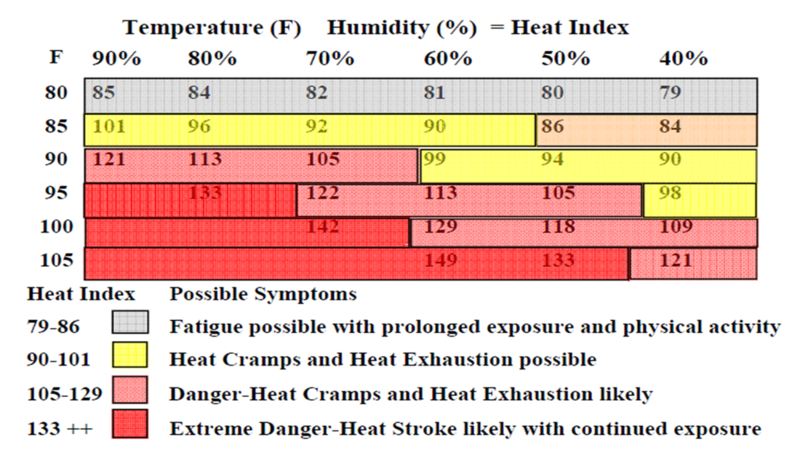 Check the heat index (table below) -limit exposure when heat index over 100. If you have diabetes know how to control your blood sugar during exercise. Check your blood sugar before, during and after exercise to learn how your body responds to exercise.